Launch of the New Mio125 onto the Indonesian Market, Scooter Featuring the Next-generation Compact Engine based on the BLUE - News Releases | Yamaha Motor Co., Ltd.
IWATA, December 8, 2014 – Yamaha Motor Co., Ltd. (Tokyo: 7272) will launch the new Mio125 scooter in Indonesia in December 2014. Developed based on the 'New! – Full of Life! – Mio' concept, the new Mio features the next-generation compact BLUE CORE engine, which takes riding enjoyment, fuel efficiency and environmental performance to all-new levels. The displacement of the new model has been increased from the current 115cc Mio J, providing the energetic riding experience promised by the development concept while achieving a similar level of fuel efficiency to the current model. 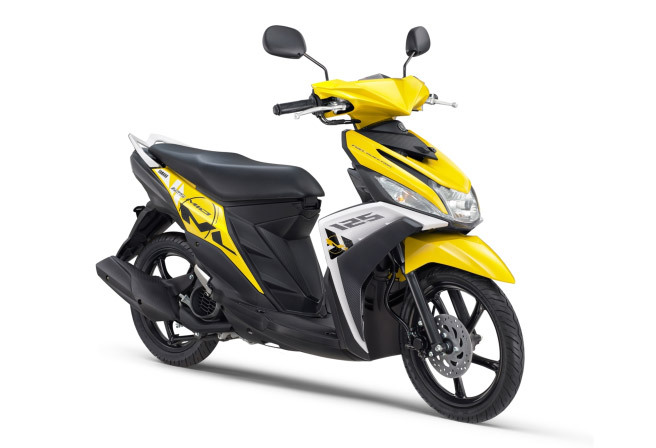 The new Mio125 has a variety of features to meet the needs of its target youth customers. For instance, various tweaks were made to the BLUE CORE engine that powered the Nozza Grande – a scooter that was launched in Vietnam in August intended for women – to boost acceleration performance for the new model. The model features 1) a lightweight body with a curb weight of 92kg (same as the current 115cc Mio J), 2) a newly-designed high-rigidity and lightweight frame that enables agile riding, 3) layered image design expressing a feeling of lightness and agility, and 4) improvements in various user-friendly features and storage spaces ideal for a commuter motorcycle. Launched in 2003, the first-generation Mio was a breath of fresh air in the Indonesian motorcycle market. Previously, the market had been dominated by models with manual transmission and an underbone frame. However, the Mio broke away, creating the trend to automatic transmission scooters – particularly amongst women – with its superior fuel efficiency, ease of riding, convenience, and style. This model led the expansion of the market, and it remains one of Yamaha Motor's mainstays. This complete revamp, which includes the upgrade to the BLUE CORE engine, further increases the Mio's competitiveness, and Yamaha Motor expects it will contribute to an expansion in sales. Manufacturing and sales is being undertaken by Indonesian group company PT. Yamaha Indonesia Motor Manufacturing.